Free Video Joiner does not require any technical experience and is very easy to use, you just need click "Add Video Files" button to add your video files in same or different formats, then click "Join Now!" button and wait for this free tool to finish joining all these video files into one video file. To cut one large video file into small pieces, try our Free Video Cutter software. 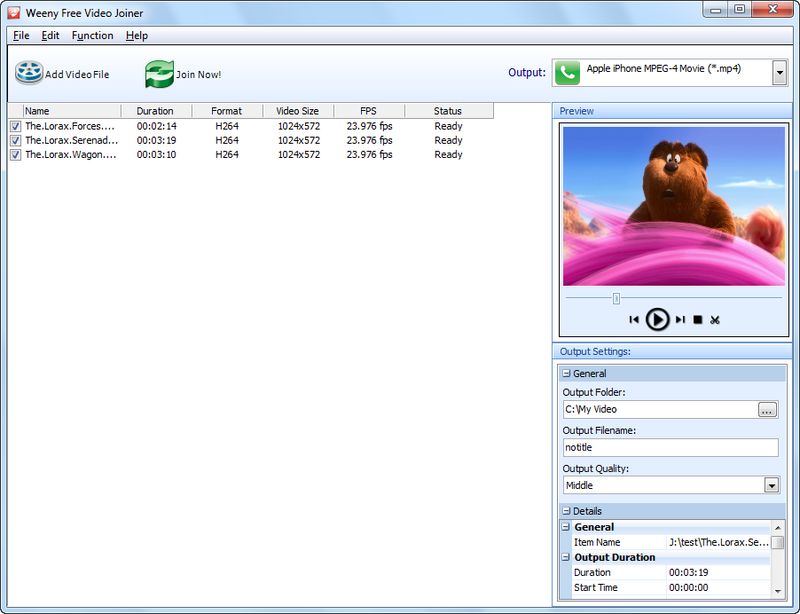 Free Video Joiner works on Windows XP, Windows Vista, Windows 7 and Windows 10, both 32-bit and 64-bit versions. After more than six months of beta versions of Free Video Joiner, we are finally releasing the 1.0 version. Our thanks to all users that participate in software beta test! Click the download button above to download Free Video Joiner full version. Full version means the installation file is complete and doesn't require additional video codec or audio codec to run. Full version also means Free Video Joiner software doesn't have any watermark, nag screen, time expiration or function limitations. Easy to use - A couple of clicks to finish video joining. Free Video Joiner - Join small video pieces into one video file. Vast video formats supports - avi, flv, mkv, mp4, mpg, rm, rmvb, vob, wmv and more. Convert video formats - Convert video formats after joining video files. Latest video codec - Include the latest video codec to support the newest video formats. I would like to thank "Weeny" for the introducing the size 1280x720 for MPEG-II output format. It helps me to make video clips yet better. 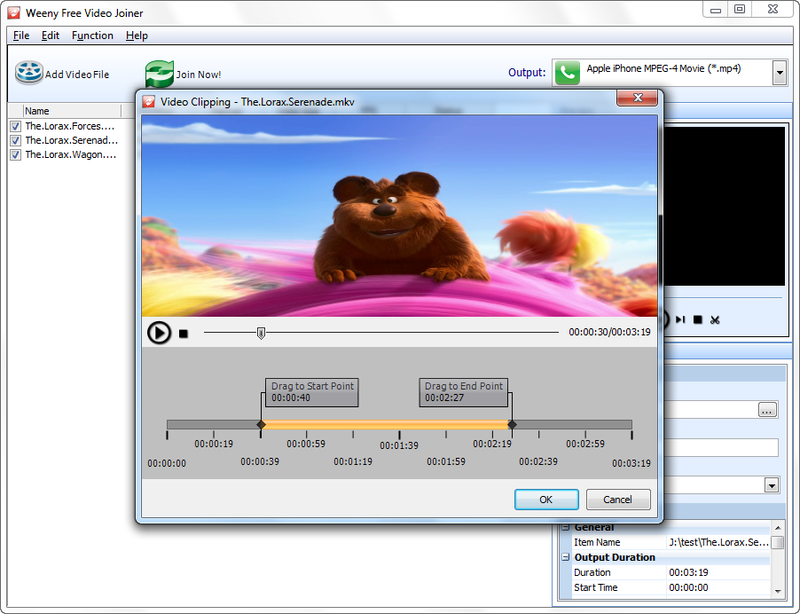 Weeny Free Video Joiner not only joins several or more movie clips together, but also allows you to convert movie clips to different output files. You can join many AVI, WMV, FLV movie clips and output them as one MPEG movie. The movie looks great if you choose the highest preset output quality in program. "Does what it claims to do"
I love your video splitter software. I'm using your video joiner beta and it's the tool I really need. - Can convert to a large number of different formats. - The progress bar doesnt make sense. It went to 100% 4 times before it finally finished. Im guessing once for each file and then once for the conversion?? - Ill fill this in when I find another con. Im impressed. It took my 3 video files, joined them and converted them to avi format in a decently quick amount of time. There are multiple output formats for phones to tablets to computers to wii. Or just customizable avi and mp4 formats like I used. 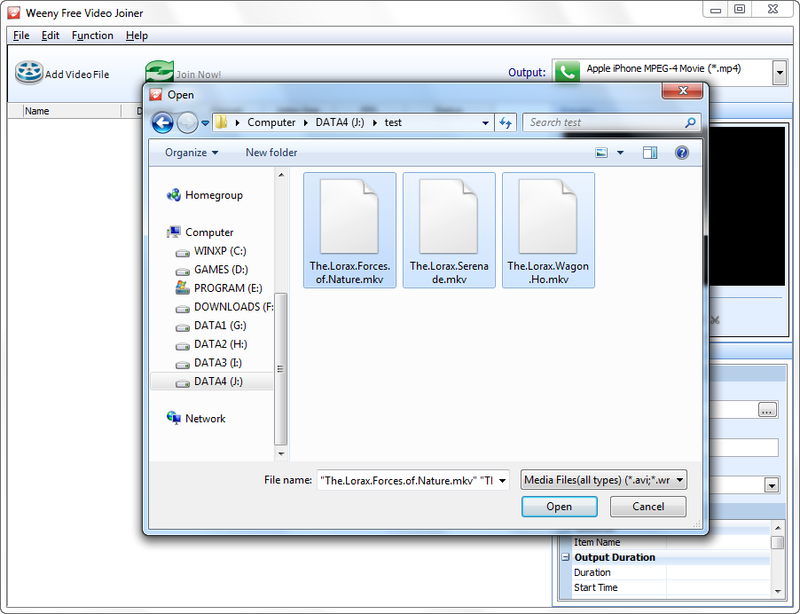 Its like a scaled down version of my any video converter, except it joins files as well.